Want to take all your PPT files with you on your beloved iPhone? 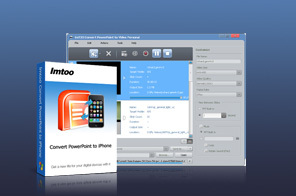 ImTOO Convert PowerPoint to iPhone makes it easy to convert all your PPTs to iPhone H.264 format videos. Now you can view your PPTs whenever and wherever you fancy without Microsoft PowerPoint. Not only can this PowerPoint to iPhone converter convert PPTs to iPhone videos, it is also a versatile PPT to iPhone customization tool. You can practice your presentation first then record your own commentary and audio, attach your own label, tweak various output parameters, and adjust the slide transition interval. In addition, with the "Express Convert", you have the option to convert any PPT file to iPhone instantly. ImTOO Convert PowerPoint to iPhone also supports batch PPT to iPhone conversion and all presentation file types. Convert PowerPoint to iPhone H.264 videos and view them on the go from your iPhone. Rehearse presentation first, and then add personalized commentary and music to it. Add ownership and copyright to your PPT file with your own trademark or logo attached. Convert a PPT to iPhone video at maximum speed without any animations and effects. Save time and effort by converting multiple PPTs to iPhone videos at once. Tweak parameters such as the resolution, quality, frame rate, slide playback interval and so on. Convert a PPT file straight to iPhone video without altering its original slide features. Preselect a “Post-Task Action” (exit application, hibernate, stand by, shut down PC, do nothing) and the desired action will be automatically performed at the end of a task. Fully compatible with all PowerPoint file types (ppt, pptx, pptm, ppsx, pps, ppsm, potx, potm, pot) of all PowerPoint versions. View slides in List or Thumbnail mode. Preview slides and the applied effects in real-time. Interface available in multiple skins and languages (English, German, French, Spanish, Chinese, and Japanese). Convert PowerPoint presentations (PPTs) into AVI, MPEG, MP4, MOV, WMV, FLV, HD videos with ease. Convert both SD and HD videos for Apple iPad.